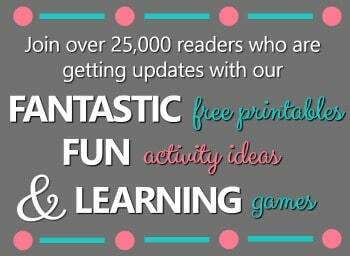 We always have a lot of fun with water play. 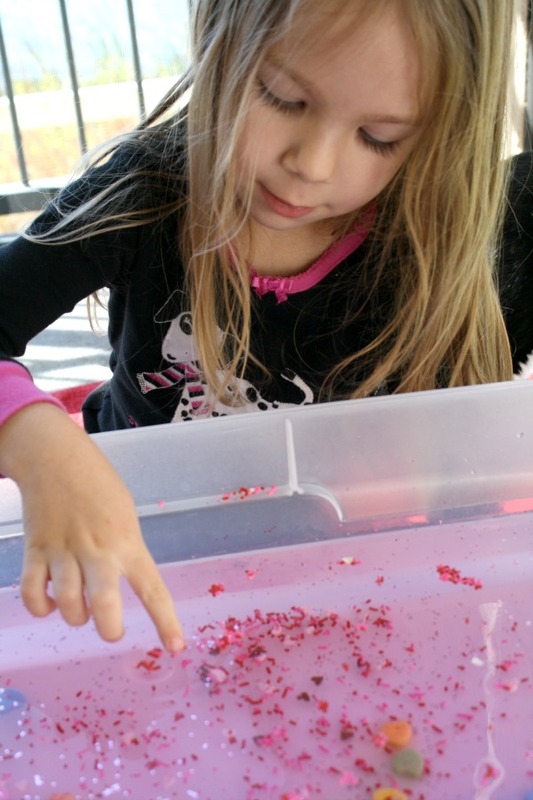 Whether we’re using flower petals, marshmallows or any random collection we find outdoors, I always love watching the direction the play goes and all the learning that happens naturally along the way. 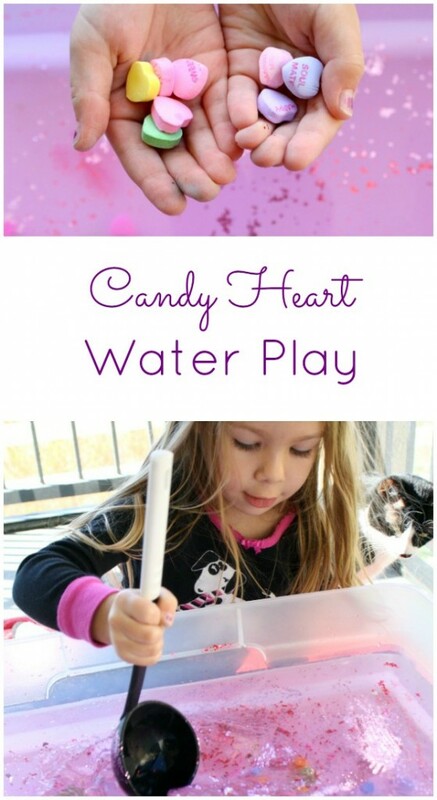 With Valentine’s Day coming up we thought we put some of our candy hearts to good use and use them in this easy water play activity. We started with a plastic bin full of water. Cold water will keep the hearts from dissolving very quickly. 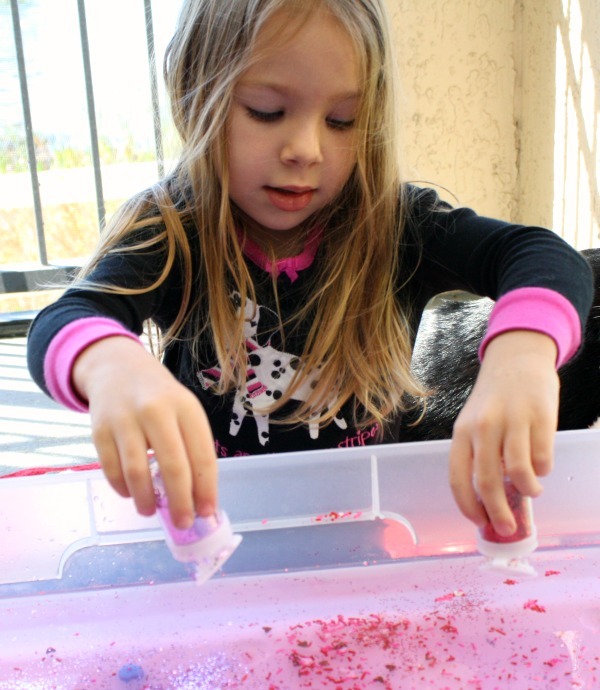 Then we added cherry extract to add a sweet scent and a touch of pink food coloring. 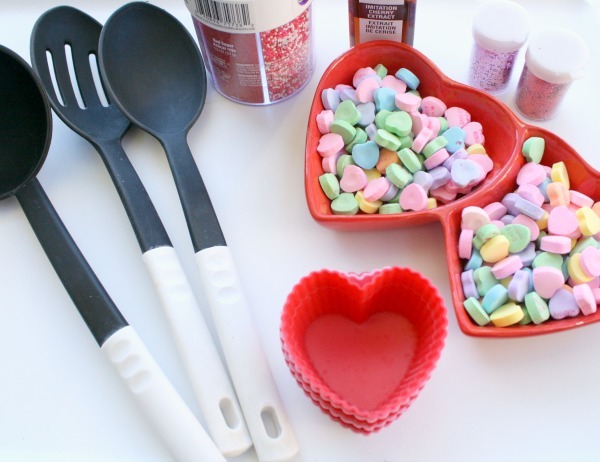 Beside the bin I set candy hearts, glitter, sprinkles, spoons, and silicon cupcake liners. We always end up with a ton of extra holiday sprinkles and candies toward the end of a holiday season, so I’d encourage you to use those ones instead of going out and buying brand new materials for this bin. 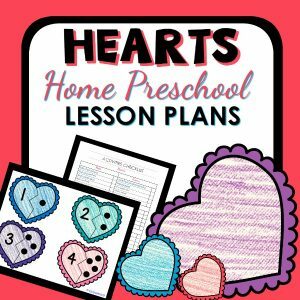 If anything, use the candy hearts for counting, sorting, patterns and more before using them for this Valentine’s Day activity. 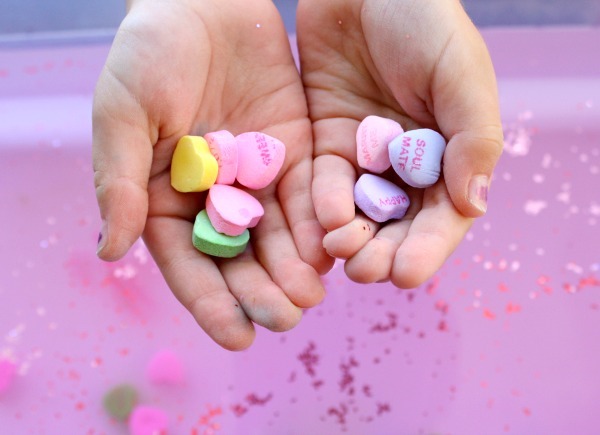 Tinker loved slowly dropping the candy hearts into the water and watching them sink to the bottom. 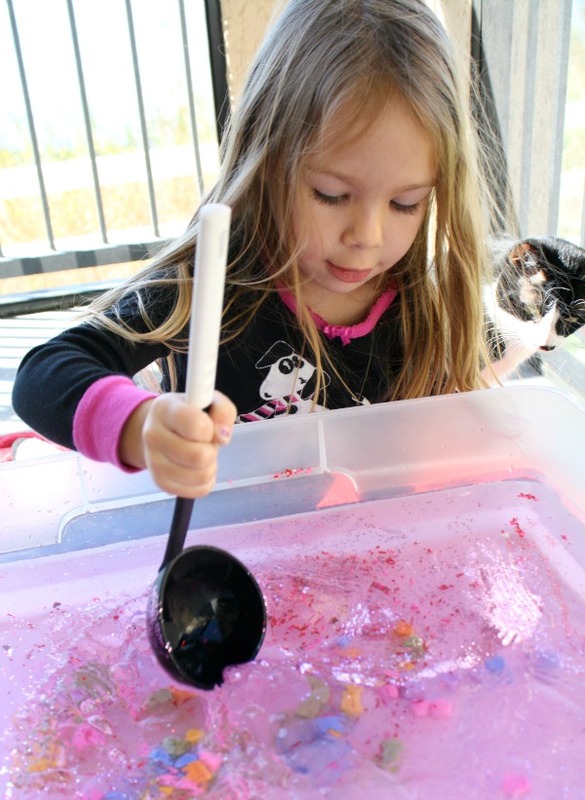 Then she had fun watching the glitter gently land on the surface and float. These actions gave us the chance to talk about vocabulary like sink, float, surface, underneath, and on top. After adding a lot of sprinkles Tinker noticed that some of them were floating while others would sink to the bottom. She spent some time poking at the ones on the surface to see how they would move across the water and ultimately sink. After all the “ingredients” were added it was time to mix up her soup. She loves to see the water swirl around. After a while I challenged her to scoop up some candy hearts. As she did she counted how many were in each spoonful. 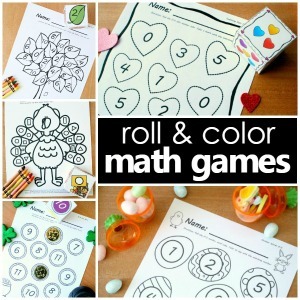 This was an easy way to incorporate a little counting into her authentic play. We also talked about whether she could predict if she was going to scoop up more or less the next time. Finally she decided to play with the cupcake liners a bit. I thought she’d fill them up on the table (which she ultimately did), but first she wanted to see what would happen if she put them in the water. She was excited to see how they floated. 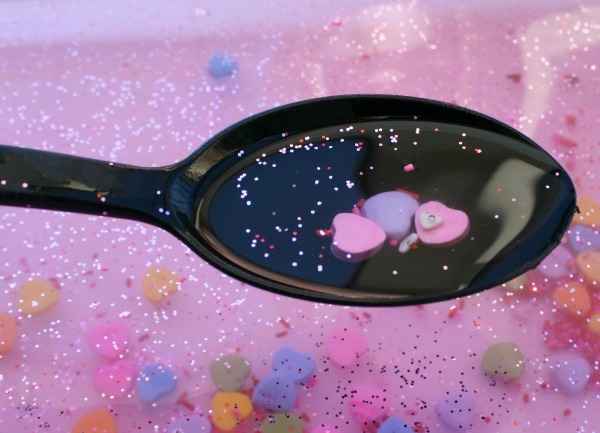 Then she experimented to see what would happen as she added candy hearts and water to them while they were floating. She was tickled to see them start to sink after adding more weight. 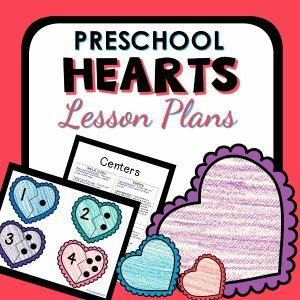 What kinds of discoveries do you think your kids would enjoy making with this Valentine’s Day activity? 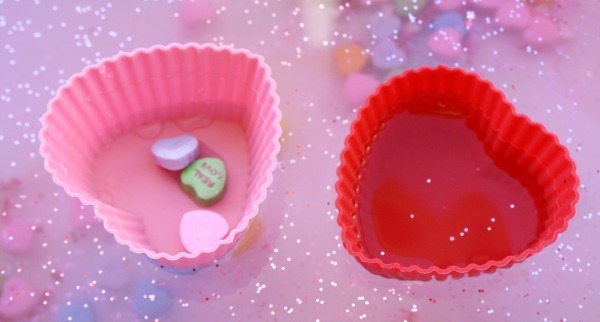 If you prefer a version that does not include food items, then check out the Valentine Soup at Fun at Home with Kids.